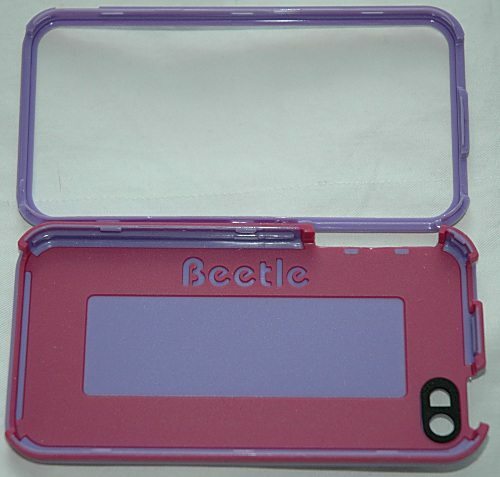 The AGF Beetle case is one of many iPhone 4 clam shell cases available. There is nothing exceptionally remarkable about the AGF, either good or bad, to distinguish it from all the others like it. It’ll do what it’s supposed to do – protect your iPhone (and keep your skin off the antenna, to boot) as you would expect a case to do, and it will look OK while doing it. 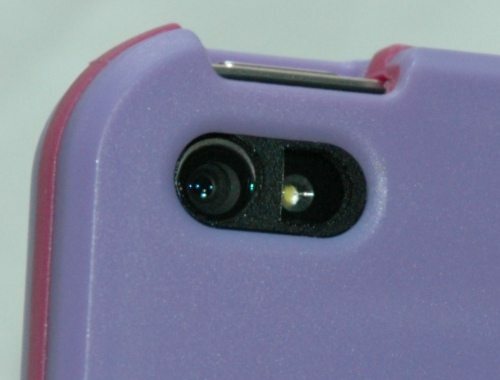 The case comes in two halves – the bottom half is lined (more or less) in a cushioning material that should keep minor shocks from turning into major damage, but I wouldn’t toss my iPhone off a building and expect it to survive. The top half doesn’t have any shock/cushion protection at all, so there’s nothing more than the hard plastic case between your phone and sudden death. The case fits snugly, and once snapped shut doesn’t come off again without a fight. Clearly there’s no chance this case is going to just come off, once you snap it down. You can see the generous cutouts for access to all the buttons, the dock, and the camera in the photos below. I didn’t notice any flash flare cause by the case in photos, and had no trouble accessing all the normal functions via hard buttons on the iPhone 4 once encased. The dock opening is very generous, but the thickness of the case will still cause difficulties for any dock accessory that has a short dock. I was able to plug in cable-style connectors with ease, but was not able to drop the phone encased onto a wall charging dock, or an iPod/Stereo dock… in both cases the connector was just a bit too short to reach. I’ve already mentioned that you can get to the physical buttons via the cutouts, but in actual use it’s less easy to get your fingers in given the extra 1/8th inch of plastic of the case. It’s not horrible, but if you have fat fingers (or man-sized ones) you might have some issues reliably hitting the volume buttons. The front edge doesn’t impede touch usage, and it seems to tolerate a screen protector without compromising the fit. 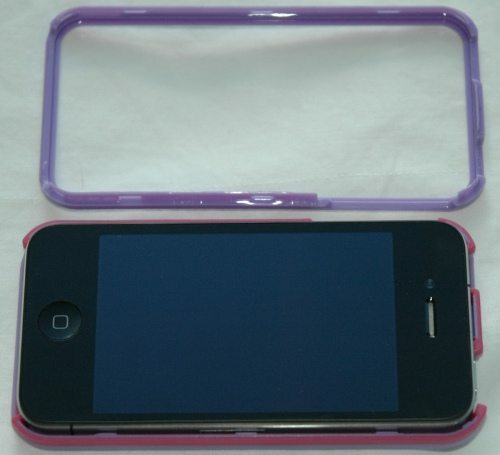 The case exterior is smooth hard plastic, so it slides in and out of pockets with ease. Unfortunately it slides in and out of hands with ease too – the case seems more slippery than glass, if that’s possible. 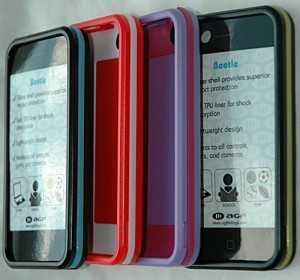 The AGF Beetle case isn’t going to supplant my case of choice (one of those rubbery ones sold at your local mall kiosks – I need some grip!) but it will do just fine if you don’t currently have a favorite case.